I walked through the historic downtown of Lübeck, like I mentioned yesterday. As Lübeck is a town of the medieval time and as Lübeck was the Queen of the Hanseatic League, you can still see the charm of that time in the architecture today. That´s why we call the old part of the city “Historic Downtown” or in german “Altstadt” here. On the photo above you can see a street called “Weberstraße” and in the background you see the church called “St. Aegidien Kirche”. The inner city of Lübeck has a lot of big churches from old times. 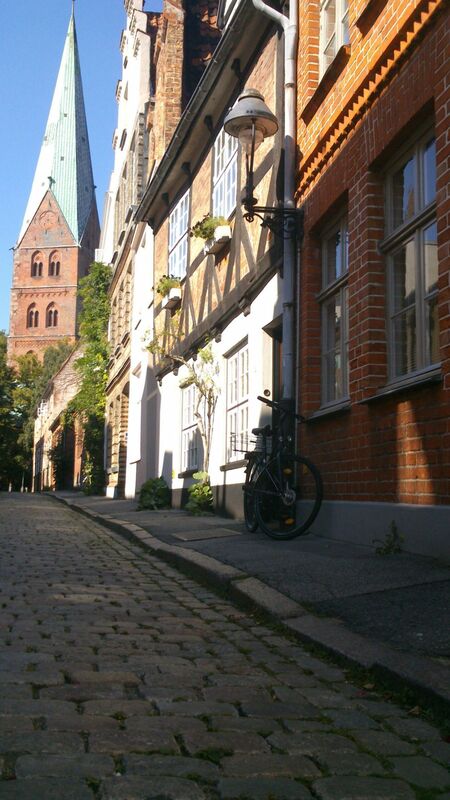 There are a lot of beautiful streets in the inner part of Lübeck. In summer you can find a lot of tourists on their city tour through Lübeck. I bet they are those who want to enjoy that medieval feeling of a very old north german town. Some time ago I hinted in a blog post, how old Lübeck is. Lübeck is founded Anno 748 under the Name “Liubice” (The Sweet) and later Anno 1143 newly created under the modified Name “Lübeck” at todays City Location. That´s why you can say long history. There is so much to tell and even if you live in Lübeck, you can´t know everything. But what they do in the schools here, is teaching the main history of Lübeck. I mean the basics you should know if you are lubeckian resident but then you can still research a lot. I think I have written already one and the other words about Lübeck in my blog, for those who are interested to know more. I will try to keep that up and you might find some more things about the topic on my blog in the future. Love’s Bliss in Lübeck… A Good Place for the Wedding? Loved Lubeck when I visited… Very nice place. Cool 🙂 Hope you had a lot of fun here. I think Lübeck really has a lot of good corners but also some ugly corners like every other city. But the inner city has really a lot of charm 🙂 Hope you enjoyed it much. I did, I have only been twice. I love the area around the Holstentor Gate. Very beautiful. Yes, that is really a good spot. One of our city emblems and a tourist attraction. The small park and grass in front of the Holstentor is a pretty good place to relax summer days. 🙂 I have some photos of that area on my computer but I wanted to make new photos some day as the other photos were made under bad weather and lighting conditions. 🙂 But you remebered me that I should take new photos of the Holstentor.